Chris Rock may be right. Still, Americans are well aware that economic inequality in their country is obscene, even though they often underestimate the growing gap between the poor and the rich. All the experts agree—from Thomas Piketty and the other members of the World Inequality Lab team to John C. Weicherof the conservative Hudson Institute—that inequality in the United States, especially the unequal distribution of wealth, has been worsening for decades now. Both before and after the crash of 2007-08. And there’s no sign that things are going to get better anytime soon, unless radical changes are made. But, as it turns out, even the experts underestimate the degree of inequality in the United States. The usual numbers that are produced and disseminated indicate that, in 2014 (the last year for which data are available), the top 1 percent of Americans owned one third (35 percent) of total household wealth while the bottom 90 percent had less than half (45.3 percent) of the wealth. According to my calculations, illustrated in the chart at the top of the post, the situation in the United States is much worse. 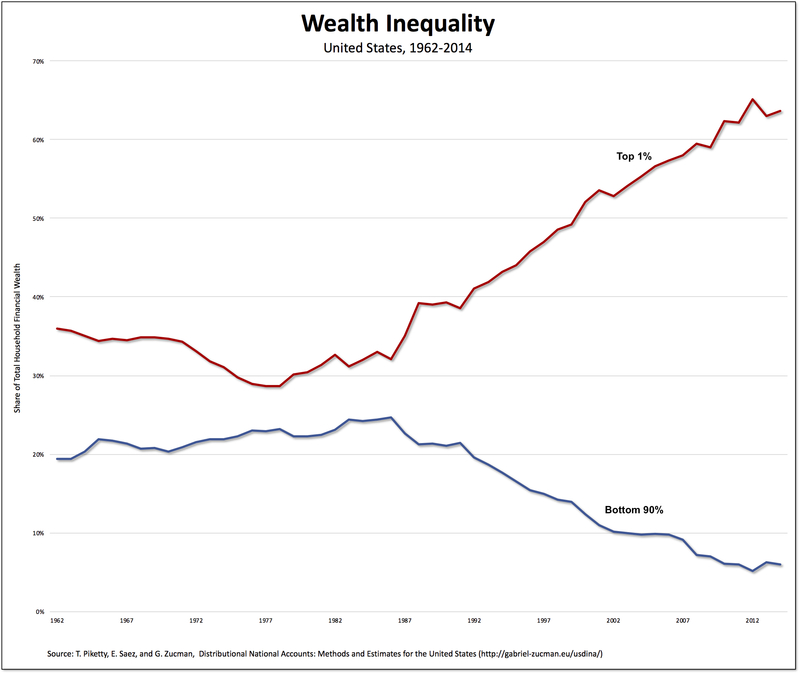 In 2014, the top 1 percent (red line) owned almost two thirds of the financial or business wealth, while the bottom 90 percent (blue line) had only six percent. That represents an enormous change from the already-unequal situation in 1978, when the shares were much closer (28.6 percent for the top 1 percent and 23.2 percent for the bottom 90 percent). Why the large difference between my numbers and theirs? It all depends on how wealth is defined. Both the World Inequality Lab and the Federal Reserve (in the Survey of Consumer Finances) include housing and retirement pensions in household wealth—and those two categories comprise most of the so-called wealth of most Americans. They just don’t own much in the way of financial or business wealth. They live in their houses and they retire based on contributions from their wages and salaries over the course of their work lives. They produce but don’t take home any of the surplus; therefore, they just don’t have the ability to amass any real wealth. For the small group at the top, things are quite different. They do get a cut of the surplus, which they use, not only to purchase housing and put aside in their pensions, but to accumulate real wealth, for themselves and their families. If we take out housing and pensions and calculate just the shares of financial or business wealth—and, thus, equities, fixed-income claims, and business assets—the degree of inequality is much, much worse. Yes, rich people in the United States are very rich—even more than either regular Americans or the experts believe. But that’s not the real elephant in the room. The big issue that everyone is aware of, but nobody wants to talk about, is class. And that’s the reason there should be, if not riots, at least a sustained political movement to transform the existing economic and social structures in the United States. What is the use of taxing private wealth to prevent inequality when we have global corporations with incomes higher than most sovereign nations. The traditional way of dealing with this problem, by the ruling class, is to convince the underdogs that they are lesser human beings than their exalted rulers. In other words, brainwashing. Good examples are the English class system and the Indian caste system. Where does all that wealth go? How is it deployed? In a similar vein, stories of missing trillions at the Defense Department make me ask similar questions? Who has all that loot and what are some plausible applications? Are they buying the world and control of assets? Are they going to use dominant positions to force compliance with whatever schemes they dream up? Control of financial wealth translates into control of people by brainwashing them into believing in the omnipotence of the “chosen ones”. In ancient times rulers were thought to have divine powers that could not be challenged by mere mortals. It is all about mind control. The way to fix capitalism is called distributism: where a large percentage of the population owns personal property (especially income producing property via rents, interest, dividends, etc.) whereas now you have the top 10% of people own 55% of all property. To see a more even distribution of wealth, you’d need around 50% of the people to own around 50% of property. More importantly, you want the idea of being economically free in the minds of the vast majority of the minds of men. Most people today think in terms of wages and security; not being economically free. The important question is: do people even want to own property? It means more than being rich: it means taking care of your real estate, your small business, voting your stock shares. It also means not spending your every dime on consumer goods and turning your savings into true property. Good to see someone else saying this. You might have mentioned the Chesterbelloc, G K Chesterton’s “Whats Wrong With the World” and “The Outline of Sanity” – even though these can be hard going for those unused to paradox and serious (satirical) jokes. Their weakness seems to be their innocence about the distribution of money: their seeing the objection to usury but not to that being built into the leverage of property prices by legalisation of reserve banking and the requiring of deeds as legal proof of property ownership. These enabled the historic eviction of established land users, inflation of property prices by banks lending more fictitious money, financiers physically holding deeds (where they could not have held physical property), the renting back (at compounded interest) of real property under hire purchase agreements, and the siezing of actual property in the event of unfortunates not being able to pay the rent on their mortgage. “If poor people knew …” . That many do is why so many of them today, though needing property, no longer take the risk of trying to ‘own’ it. The strength of the Chesterbelloc, then, lies in its having distilled the history of life before capitalism and understood the need for a more distributed, less urban way of living. That is not the end of the story, for Ghandi got the inspiration to be really Indian from G K Chesterton, E F Schumacher ended up a Distributist and the successful Mondragon cooperatives in Spain have demonstrated the value of investing money where the need is, not where the money is. 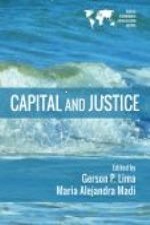 “When considering the relations between urban public policies and the commons, her latest works highlighted the challenges to collective-action in metropolitan areas where citizens can less effectively articulate preferences, define problems and choice packages of urban public goods and services”. Belloc was highly critical of the Statute of Frauds of 1677 in “The Restoration of Property.” The statue said that all property owners needed a contract to prove their ownership, but the small owner had no such document, as most of their property passed through tradition from father to son. In effect, the land being used by the small owner was taken from them and given to the large owner. Kelby, you are of course absolutely right. Apologies for an ambiguity from my trying to be brief. I was focussed on the operation of the usury scam via fake money and mobile deeds, not the initial creation of the property market by dispossession. Two observations and a comment. First, all these inequality graphs begin their inflection during the 1980s. 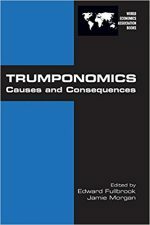 What actions were taken, and policies implemented during the 1980s that might lead to such massive inequality in the early 21st century? Second, we need some historical perspective on wealth and wealth difference. According to Piketty’s research the average income in the UK in the early 19th century was 30 pounds, rising to 40-50 pounds by 1850. To have a comfortable and economically secure life required, however an annual income of 500-1000 pounds, again remaining nearly constant till 1900. In 18th and 19th century UK half the population could afford to eat meat every day. In other words, about 50% of the people were wealthy or at least reasonably well off. Below them about 30% of the population could afford to eat meat between 2 and 6 times a week. They were ‘poor’. The bottom 20% could only eat meat once a week. They were very poor. At least part of the time they had to rely on poor relief. If these data are correct, this means UK inequality in the 18th and 19th centuries (you know Dickens’ world) was less severe than presented in this video, https://www.youtube.com/watch?v=QPKKQnijnsM depicting current US economic inequality. For the best economic books you will ever read regarding english capitalism and its history, read “The Restoration of Property” and “The Servile State” by Hilaire Belloc. So, I have seen balance sheets etc. for the house hold sector in national accounts. Are they available broken up into the top 1% and lower 99%? Yes, what happened near 1987? I have no idea if this part of it, but I observed the following. Home computers started to get big (automation). Also, later the internet got big, (communication and automation.) In 87 many people were using modems but universities were using the internet. Automation might have helped capitalists more than workers. What else happened at that time and afterwords. Ronald Reagan was the U.S. president from January 20, 1981 – January 20, 1989. He was the first conservative president in more than 50 years. His first task was to combat the worst recession since the Great Depression. To do so, Reagan promised the “Reagan Revolution.” It focused on reducing government spending, taxes, and regulation. His philosophy was “Government is not the solution to our problem, government is the problem.” Reagan was an advocate of laissez-faire economics. He believed the free market and capitalism would solve the nation’s woes. His policies matched and helped justify the “Greed is good” mood of 1980s America. Reagan’s economic policies are known as Reaganomics; a version of the theory of supply side economics. This theory says tax cuts encourage economic expansion enough to broaden the tax base over time. The increased revenue from a stronger economy is supposed to offset the initial revenue loss from the tax cuts. But according to the Laffer Curve, this only works if the initial tax rates are high enough. In this sense Reagan was lucky. Rates were high in the early 1980s. Reagan wanted a free-market, laissez-faire economy. Which would he though end inflation problems and return equilibrium to the economy. To accomplish this Reagan began a wave of deregulation. Reagan removed controls on oil and gas, cable television, and long-distance phone service. He further deregulated interstate bus service and ocean shipping. In 1982, Reagan deregulated banking. Congress passed the Garn-St. Germain Depository Institutions Act. It removed restrictions on loan-to-value ratios for savings and loan banks. Reagan’s budget cut also reduced regulatory staff at the Federal Home Loan Bank Board. As a result, banks invested in risky real estate ventures, ending with the savings and loan crisis of 1989. Reagan did little to reduce regulations affecting health, safety, and the environment. In fact, he reduced regulations at a slower pace than the Carter administration. Reagan’s enthusiasm for the free market did not extend to trade. Instead, he raised import barriers. Reagan doubled the number of items that were subject to trade restraint from 12 percent in 1980 to 23 percent in 1988. While not a union buster, Reagan saw little use for unions in a functional free-market, laissez-faire economy. Most of these policies put downward pressure on salaries and benefits for workers, while removing restrictions on capital accumulation and financial speculation (mostly with other peoples’ money). I also recommend three books that provide a comprehensive narrative (some charts but not many) on class, poverty, and the poor in America. White Trash: The 400-Year Untold History of Class in America, Jun 21, 2016 by Nancy Isenberg. A People’s History of Poverty in America (The New Press People’s History Series), Jun 7, 2011 by Stephen Pimpare. White Trash: Race and Class in America, Feb 20, 1997 by Annalee Newitz and Matt Wray. The first and second are by historians. The third by a mix of social scientists, historians, medial studies, literary, and art scholars. Most people, including Mr. Ruccio, seem to confuse being rich and being wealthy. “Rich” refers to a standard of living supported by spendable (i.e., net) work income. If work income does not go into investments, it is indeed, as Ruccio states, not increasing one’s wealth. It just pays for living expenses – a large chunk of which is debt service and other rents paid to use stuff. On the other hand, “wealthy” refers to a standard of living supported by (net) investment income – usually from dividends, accrued portfolio value, real estate investments (house) and/or pensions. The big contrast between the 1% and the 90% is the age at which wealth income replaces work income. It is much sooner for 1%ers than for working stiffs. But, most 1%ers work anyway. They just have a higher quality of life for their standard of living. Housing most definitely is a form of wealth, because most people retire having paid off their mortgages, and over time, their houses have accrued value well above the purchase price. Once retired, ownership means living rent-free, which increases spendable income. In my case, it was about $36K/year going into my bank account rather than the bank’s equity account. Pension income too is most definitely a form of wealth even though like home ownership, it too is deferred until retirement. Nevertheless, pensions (like any deferred payout investment) produce income over time. Many people have pensions that would require over $1M in investments, and in fact, most pension payments derive from managed investments like mutual funds; not company profits. Finally, there is 401K-type wealth, which also accrues deferred value in the equities market similar to 1%ers’ investments. 401K’s accrue value by work contributions, reinvested dividends, and growth over time. They just do not produce income until retirement. Moreover, despite payouts in retirement, the capital continues to accrue market value. My 401K grew 20% last year despite IRS required withdrawals. Thus, my wealth continues to grow even though I am now supporting the same standard of living as when working. However, debt-free in retirement, my spendable income rose, thereby increasing my quality of life in the bargain. So, I am not buying Ruccio’s graph of doom. On the other hand, even using my definition of wealth, the distance between the wealth of even the top 10% (minus the top 1%) and the top 1% is still obscenely huge. I think this blog makes an important distinction. Financial wealth translates into power in a way that that owning a nice residence or a steady pension does not. Sure, the distinction isn’t perfect. Having a big house bestows power, to share or deny shelter with others. A pension isn’t transferable, though it creates an income stream. And Mitt Romney stashed $100 million in a tax-advantaged Individual Retirement Account, I recall. (Are IRAs included or excluded in the graph here?). Nice to see a lot of comments. It speaks to the importance of the issue. The massive shift in financial wealth we have witnessed in the last number of years is an indicator of complacency of the vast majority of people, allowing a minority to grab the ability to create new money on their own behalf. They have been getting away with it and we are now faced with the prospect of renewed serfdom. Money is power because everybody wants it. Its creation should be a public service rather than a private enterprise. Total net worth in U.S. doubled, from $48 trillion to $96 trillion, nominally, in 9 years, 2009 to 2018 (U.S. Federal Reserve report, Flow of Funds, page 2). Adjusting for inflation, increase was 71%. It’s time to tax financial assets. The income of financial assets are taxed. March 2009 was when the stock market started going up from a low from a crash. It could sound like cherry picking the data. It would be better to use a longer time frame for that argument. Because that time period does not include losses in asset values in the financial crisis. The longer time series of flow of funds can be downloaded from their site. Also, they can often be found on “Fred graph” and you get a graph and the data can be downloaded. It is also quite possible that inflation has been understated. One might do better gathering your own data. Did you save your receipts and have your check book register that you use for paying bills? Or, if you have been keeping regular accounts they can be used to measure inflation. I was surprised to see large oranges selling for $0.99 per orange in the grocery store a year ago. The price of many things was surprising. Perhaps countries making peace and saving people and money is a better avenue. The Rabbi was very wise. S/he might have based such wisdom on the various works of literature (the Sin Eaters – the original and the more modern up versions). It is extraordinary what learning the alphabet (ABJAD) can achieve! One wishes that our esteemed economists would al least apply the basis of economic theory of status realistically, if not wisely or critically. Perhaps the new breed of their students will be rich enough to eat up their sins without dying of morbid obesity.